What the Heck is a Linear Equation Anyway?? If you really want to improve your marks in math, pay attention to the words of math. Once you begin learning and using the language of mathematics, you'll begin to see the ever present sense of it. For instance, if you've just learned to write and solve "linear" equations, you should realize that the name is telling you two things. It's telling you that a linear equation has something to do with a line -- hence the "linear" -- and it's also telling you that you're going to see an equal sign since you'll be looking at an equation. So what the heck is a linear equation anyway?? A linear equation is an address. It describes exactly where, in Cartesian space, that line exists. It's almost like your home address. It defines where you live -- so does a linear equation. 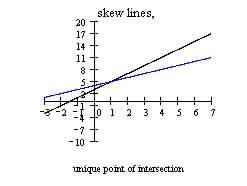 If we consider the linear equation y = 5x + 10, we can plot a series of points and draw this line. It will cross the y-axis at (0, 10), cut the x-axis at ( 2, 0) and, once we have two points on the line, connecting them defines the line. on this line satisfy the relation y = 5x + 10. Points off the line will not satisfy this statement. Thus the line is the set of all points (x, y) such that the y-value is 5 times the x-value plus 10. By the way, all the points in the plane above the line will satisfy the inequality y > 5x + 10, while the points below the line satisfy y < 5x + 10. When we have a system of two linear equations, we have an interesting situation. The two equations can be solved algebraically and simultaneously and the result will define the point where the two lines meet when we graph them. Of course, there are three possibilities. The lines can meet at exactly one point, no points because they're parallel, or an infinite number of points because the two lines are superimposed upon each other. In such a case, one equation will just be a multiple of the other. Let's look at each case. Say we have y = 2x + 3 and y = x + 4. Since one is not a multiple of the other and the slope of one doesn't equal the slope of the other we know that these lines are neither coincident nor parallel. So there must be a unique solution. When we solve by setting the two expressions for "y" equal to each other, we get that x = 1 and y = 5. If we graph these two lines, we will find that they meet at the point (1, 5). Now say we consider y = 2x + 1 and y = 2x  3. Since the slope of a line is the coefficient of "x" when our equation is in this form, we see that both lines have the same slope and therefore they are parallel. So, there are no solutions. In other words, these lines do not intersect anywhere. And finally, let's consider y = 2x + 3 and 3y = 6x + 9. As we can plainly see, the second equation is just the first one multiplied by 3. 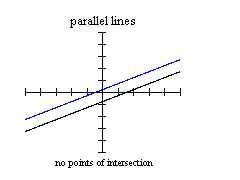 So these two are not different lines but the same line, which means there are infinite points of intersection. 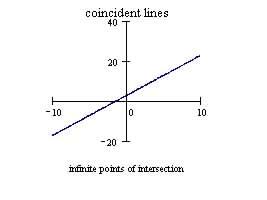 The lines are coincident or superimposed on each other so they intersect at every single point on the line. Don't ignore the words in math. They tell you a lot. After all, math is just a language or code that humans developed in order to describe our reality. Learn the words -- you'll learn the math.